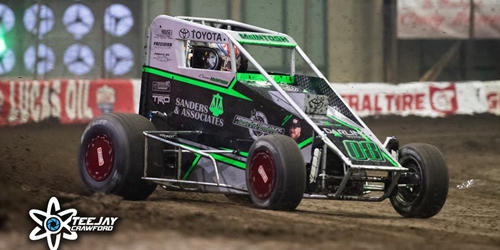 McIntosh Races to Top Five Finish in Chili Bowl Debut – Youngest Top Five Finisher in Event History! Lonnie Wheatley, BIXBY, Okla. (January 16, 2019) – He may have entered Wednesday night’s 33rd Lucas Oil Chili Bowl Nationals preliminary event as a relative unknown in a Tulsa Expo Center filled with auto racing’s biggest stars including the likes of Kyle Larson, Christopher Bell, Rico Abreu and more. By the time the night’s final checkered flag flew, a packed house all suddenly knew who Cannon McIntosh is. After celebrating his 16th birthday less than one month ago, McIntosh drove the RL Hudson/Toyota-TRD No. 08 Midget to an eye-opening fifth place finish in Wednesday’s Hard Rock Casino Qualifier at the Tulsa Expo Raceway that included 72 of the event’s approximately 350 entries. The fifth-place finish made McIntosh the youngest driver in the event’s 33-year history to finish among the top five on a qualifying night, a mark previously held by 2017 USAC Midget champion Spencer Bayston. Bayston posted a top-five finish in 2014 at the age of 16 years and three-and-a-half months. With the fifth-place run, McIntosh will grid one of Saturday’s twin “B” Mains approximately three to four rows deep, pending Friday night’s winner redraw. Each of those “B” Mains will transfer seven to the 55-lap Chili Bowl championship “A” Main. Following a solid practice session on Monday to shake down car, McIntosh was eager for Wednesday’s first dose of Chili Bowl competition. If there were any nerves, it certainly didn’t show on the track. Gridding the night’s fourth of nine heat races inside the fourth row, McIntosh dodged an opening lap tangle and then promptly made his way into fourth before being credit with third by race’s end. Sitting sixth in passing point after heat race action, McIntosh started fifth in the second Qualifier and once again moved forward to claim a solid third-place finish and secure the seventh starting position for the feature. As the green flag flew on the 25-lapper, McIntosh held his ground early on and began working the low side of the track to his advantage to gain ground on the leaders. He was able to do something, battling with some of the event’s legends as he battled past five-time Chili Bowl champion Sammy Swindell for position and then made a late move past 2006 Chili Bowl winner Tim McCreadie to secure the fifth place finish in the closing laps. While McIntosh has established himself among the leading Chili Bowl Rookie contenders, he entered the week with two full seasons of Midget racing action under his belt. After earning POWRi West Midget Rookie of the Year honors and ranking fourth in 2017 series points, McIntosh ranked sixth in 2018 POWRi West Midget points despite missing several events. McIntosh has a pair of POWRi West Midget feature wins to his credit including a 2017 score at Missouri’s Springfield Raceway and a 2018 triumph at Oklahoma City’s I-44 Riverside Speedway. McIntosh’s maiden Chili Bowl voyage is already off to a remarkable start. He’ll try to add to it on Saturday night as he tries to race from “B” Main action into an “A” Main reserved for 24 of the world’s racers. Along with RL Hudson and Toyota-TRD, other marketing partners making the ambitious 2018 slate of events possible includes American Discount, Complete Auto Care, Best Graphics, Fieldhouse Gear, Precision Inspection, Sanders and Associates, Panels by Smoke, Walker Performance, Sanders Wheels, American Discount Brake and Muffler, D&N Fabrication and Car and Fleet. 2019 Quick Stats: 1 race, 1 top-five, 1 top-ten. Up Next: 33rd Lucas Oil Chili Bowl Nationals finale on Saturday, January 19. 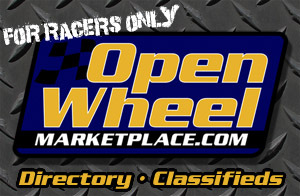 Keep Track: Keep track of Cannon McIntosh’s on-track action including schedule and results at https://www.facebook.com/cmacracing/. If you would like Cannon McIntosh Racing press releases e-mailed directly to you, send your e-mail address to Lonnie Wheatley at lonniewheatley@gmail.com. Penning the recurring series of “The Wheatley Chronicles” articles on www.sprintcarmania.com, Lonnie Wheatley provides media, public relations and more for select tracks, drivers and events. For more information, Wheatley may be contacted at lonniewheatley@gmail.com.